Kim Laudati is a skin genius. An epidermal miracle worker! Last year, while on a business trip in LA, I broke out like a teenager. This is not a normal occurrence for me — I have a skin regimen, I regularly get facials, I take care of myself… So I freaked out. In a fit of desperation, I asked a West Coast doctor friend (NOT a dermatologist) to shoot me up with a little cortisone. But I kept hitting walls! No online information was helpful or useful. None of the doctors I talked to thought my face would ever repair itself, as the damage was too severe. 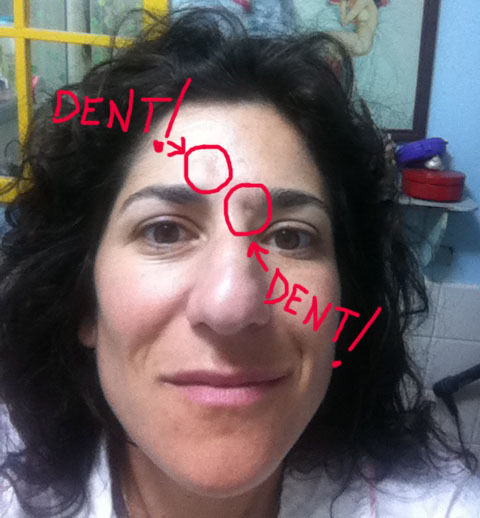 My dermatologist suggested tearing the dents apart with a needle, a process that would leave me with gaping wounds for weeks and wasn’t guaranteed to work. 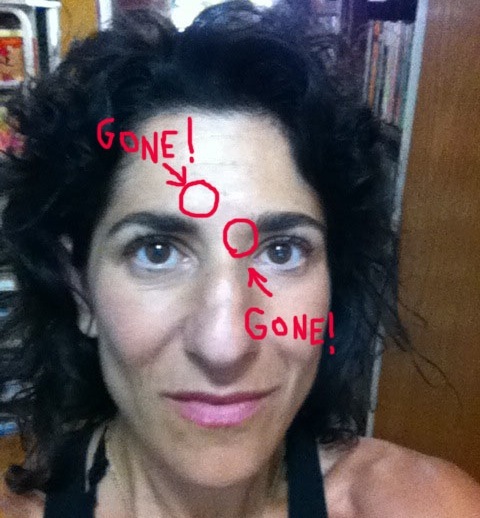 A plastic surgeon friend suggested fillers… FOREVER. I was despondent. That’s when I lucked out and stumbled on Kim Laudati Skin Care. I’ve always been a sucker for a fancy facial. Triple Oxygen, Red Carpet, Galvanic Current… You name it. So when I read about Kim’s ‘Le Magnifique’ – a combination of ultrasound, ultrasonic resurfacing, radio frequency, micro current, red and infrared LED light, and wet oxygen therapy – I had to give it a try. Once laid out in her treatment room, I told Kim about my cortisone troubles. She explained how her combination of high-tech treatments actually builds collagen, and that she’d successfully used the technique to fill in scars on different clients’ body parts. She proposed a plan – why not come in once a week for a half hour, and see if she could improve the problem? I had nothing to lose, so I let her at ‘em. Within 8 weeks, they were GONE. No needles, no wounds, no pain, no downtime, no nothing. But wait – I still haven’t told you about Le Magnifique! Gang, it was all that. 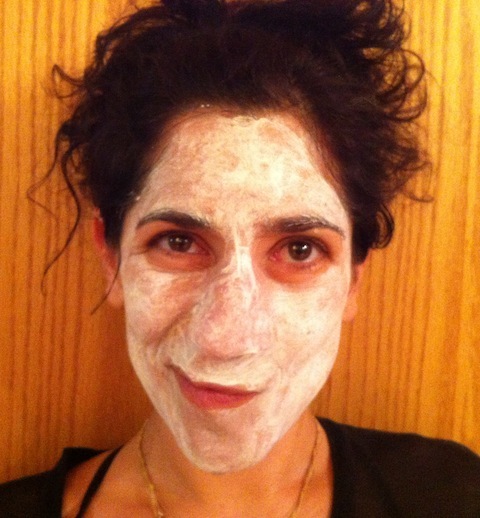 We are talking a faaaaaaaabulous facial. Your skin looks dreamy immediately afterward, you actually look younger, and you keep glowing for the rest of the week. Consider this: If the technology she’s using was able to make my dents disappear, imagine what wonders her full facial does for your collagen production. She’s like a one-woman fountain of youth. Now go run and book yourself a facial at her new Madison Avenue spa before she becomes too famous to get an appointment (I actually worry about this)! You look fantastic!!! (You always look fantastic!)! Also glad you liked the Nolex! I think it runs btw $300-400 in USD. Not sure b/c I bought my first one when the exchange rate was terrible, and the others were less b/c I bought them in Europe. I know you can get it from LuisaViaRoma.com, and I think Project 8 carries them here in the US (sometimes Barney’s, too). Posting a new audio interview and video piece today — hope you like! Thanks so much for posting this. This is the only treatment I’ve seen that gives me some hope. I will definitely be contacting this spa. Your improvement has been truly amazing! Thanks Steve! I’m so glad I could help — Kim is THE BEST.